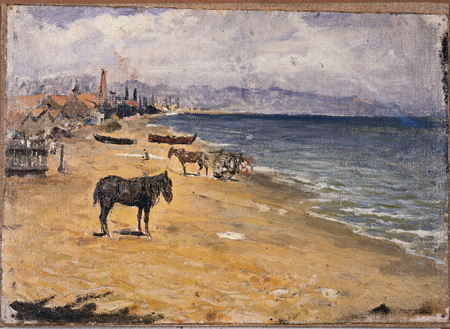 Barceloneta Beach by Pablo Picasso, 1896 – Oil on canvas. Note the factories of Poble Nou and I think La Maquinista in the background. Picasso lived in the city as a young man between 1895 and 1904. It is also striking how bare the Catalan coast painted in the background was. We forget the massive reforestation in Spain since the 1960s as people no longer had to cut down trees for fuel.